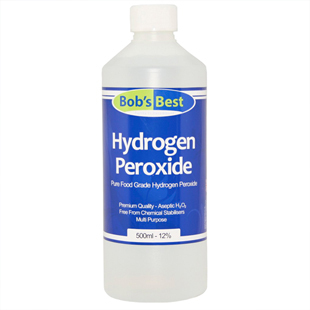 Food Grade Bob's Best superior, additive free 3% Hydrogen Peroxide in a useful 500ml spray bottle for chemical free, non-toxic cleaning in the home or workplace. Food Grade The strongest, publicly available Hydrogen Peroxide solution. Ideal for diluting down with distilled water to weaker strengths for use in and around the home. Food Grade For those not keen on diluting down 12% hydrogen peroxide, we offer this 3% solution, ready and waiting to get to work in and around your home. 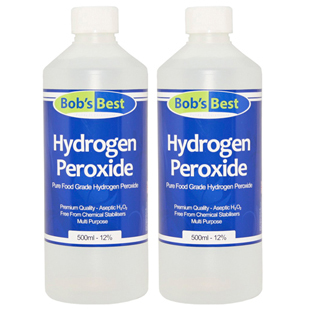 Two half litre bottles of Bob's Best premium hydrogen peroxide makes our one litre pack size great value for money. Contact us for details. 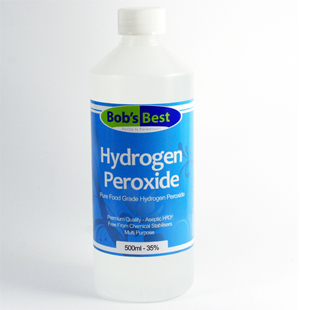 Our best selling Hydrogen Peroxide product before the restriction on its sale. Contact us for details on how to obtain the licence required for this restricted strength. 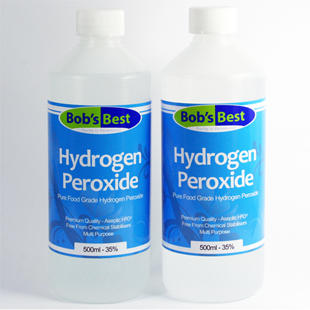 Food Grade A one litre pack size (2 x 500ml) of our very popular 12% hydrogen peroxide product. A cost-effective way to buy this useful household staple. Once a great introduction to this simple yet versatile substance, this item is no longer available due to changes in UK law. Contact us for details. Hydrogen Peroxide is a liquid that is similar to water but has an extra atom of oxygen in it's molecule. It is this extra atom of oxygen that gives hydrogen peroxide its extremely useful and beneficial properties. The chemical formula for hydrogen peroxide is H2O2 and as a molecule, H2O2 is highly reactive. It is keen to revert to a more stable form and it readily breaks down into water (H2O) and oxygen (O2). H2O2 is a natural chemical abundant in nature. The human immune system utilises this incredible substance to kill pathogens and rid the body of germs. It is also produced in the upper layers of our planet's atmosphere where it precipitates back to earth cleansing the air we breathe and oxygenating waterways. Our H2O2 products are as natural as possible and contain absolutely no stabilisers or additives. 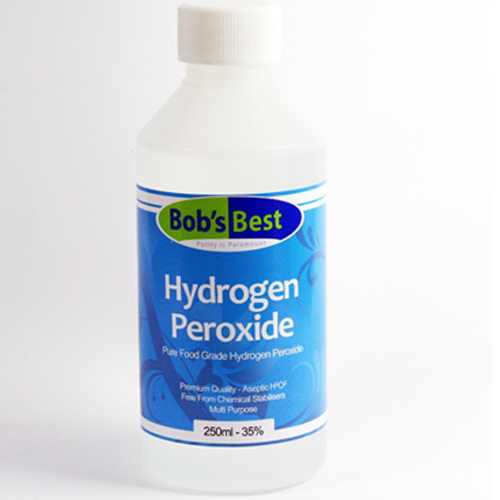 For almost all uses of hydrogen peroxide you must first dilute it to the required concentration. It is very simple to dilute to the correct strength using our dilution chart (see below). For some it can be a little confusing because of misleading information published online and in popular books such as The One Minute Cure. 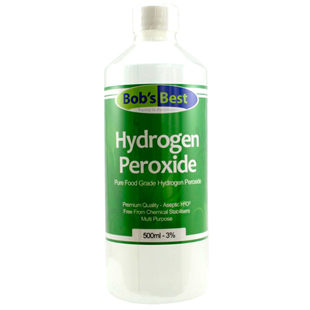 A common myth is that you must only use 35% food grade hydrogen peroxide for home and personal care / health applications. Although many of these sources are correct about the type (the grade) of hydrogen peroxide you should use, they are often incorrect about the strength (% concentration) needed. Only pure food grade hydrogen peroxide should be used as other grades of hydrogen peroxide may contain harmful chemicals. These additives are used to stabilise the solution, preventing the release of oxygen and are often extremely toxic. Our pure food grade hydrogen peroxide contains no additives making it safe for use in the home, for food preparation and for health uses. Pharmaceutical grade hydrogen peroxide is safe for topical use on the skin and as a disinfectant but should never be used in food preparation. If your directions state to use 10ml of 35% H2O2 in 110ml of water your final solution will be 3% H2O2. By using 3 times more 12% (30ml of 12% H2O2 in 110ml of water) you will achieve the same result. The sale of H2O2 above 12% is restricted in the UK and Europe, so 12% food grade hydrogen peroxide is the only cost effective alternative to using 35%. Simply use 3 times more 12% H2O2 than 35% H2O2 for the same result and final % concentration. Fruit and Veg Wash - Food Grade H2O2 can help to increase the storage life of your fresh produce by removing mould, pathogenic microbes, dirt and even pesticides. Simply add 25ml of 12% H2O2 or 100ml of 3% in a bowl of fresh water and soak for up to 20 minutes. Most types of fruit and veg will float to the surface. We use a clean Pyrex measuring jug to keep everything submerged until ready to remove. Once removed, rinse and leave on a draining board to dry thoroughly before packing to store back in the fridge or in the fruit bowl. 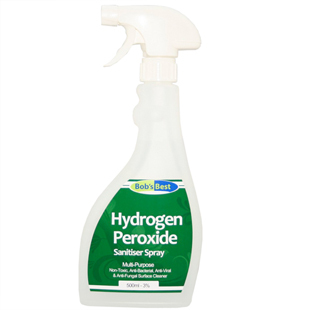 Non-Toxic Disinfectant - Hydrogen Peroxide is extremely effective at killing unwanted microbes with the added benefit of being 100% non toxic. Apply 3% H2O2 directly to surfaces as required and allow 5 minutes to dry. The peroxide will break down into water and oxygen leaving behind no unwanted residue. It's great for cleaning your chopping board! Be cautious with wooden worktops or varnished surfaces however, as continued long term use can result in a slight colour lightening. Natural Anti-Septic - Use 3% H2O2 directly onto skin abrasions to clean the wound and prevent infection. Bleaching Agent - H2O2 has a natural bleaching effect and can be used to whiten fabrics and other materials. We always recommend to start at a weaker concentration (3%) and build up until you reach the desired result. You may notice a mild bleaching if your skin comes into contact with H2O2. Do not worry as this is temporary and after a few hours the skin will return to normal. Prolonged and repeated exposure can result in drying of the skin and irritation. Oral Care - Because of hydrogen peroxide's bleaching and antiseptic properties is very useful for dental health care. Use 3% H2O2 to disinfect toothbrushes. H2O2 can also be used as an antiseptic mouthwash and natural teeth whitener. We recommend that you consult your dentist before use. Foot Soak - Commonly used to aid the treatment of fungal nails, H2O2 kills fungus and bacteria upon contact. Use up to 250ml of 12% H2O2 in a large bowl of warm water and soak feet for a minimum of 20 minutes. Bath Soak - H2O2 can also be used in the bath for an oxygenating and energising soak. Use 500ml of 12% per 100 litres of water. Avoid contact with eyes. Hydrogen Peroxide Therapy - We are commonly asked about the internal use of hydrogen peroxide to treat disease. We are unable to advocate the use of hydrogen peroxide for oxygen therapy. If you are considering doing so, you must only do so under the direct supervision of a healthcare professional. Always ensure your practitioner is suitably qualified and is licensed to administer medical treatment. Food grade hydrogen peroxide readily reacts with minerals, metals and organic materials releasing oxygen. The minerals contained in tap water and spring water cause H2O2 to break down and decompose back into water and oxygen so only pure water can be used. The best source of water is Distilled Water as it is the purest source of water available. You must always use a suitable, clean and sterile container. We recommend you do not use glass containers to prevent the risk of breakage/spillage, although weaker concentrations (3% and less) can be stored in glass if handled carefully and the glass container is opened regularly to release the build up of gaseous oxygen. Ensure you always store hydrogen peroxide in the dark and not in the fridge. Do not freeze. H2O2 will sterilise all microbes it comes into direct contact with by oxidation. This release of oxygen or decomposition weakens the solution so always make sure all measuring equipment and containers are as clean as possible. For solutions above 6% always avoid direct contact with the skin and we recommend that you should wear suitable protective clothing (gloves, eyewear etc). As H2O2 is keen to breakdown into water and oxygen is important to store it correctly. Store in a cool dry place away from direct sunlight. Keep out of the reach of children. Prevent contamination by proper handling. In the event of accidental exposure rinse thoroughly with plenty of water. Although we are unable to advise you in any way with regards to medical uses of this product we can make sure you have as much information as possible to make your own well informed decisions. For more information please feel free to contact us via email or call us on 01884 33037.